A very high quality 223 ammo made by Fiocchi, an Italian producer of reliable ammunition, with a penchant for selling great ammunition at incredibly low prices. 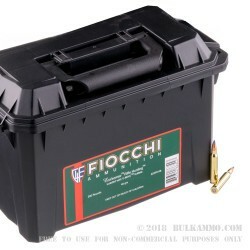 This offering is proof of the substantial quality of the Fiocchi brand, as it combines a 40 grain V-MAX polymer tipped bullet with a Boxer primed brass casing and a free ammunition can. 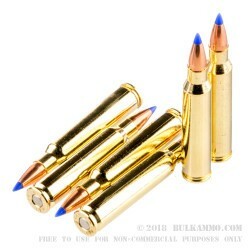 Given the price, you can easily justify this load as a plinking round, but it is very well suited as a 100-200 yard varmint round too. The flat shooting, lightweight projectile hits 3650 fps at the barrel, with 1185 ft. lbs. of energy. Given those numbers, the price point seems unrealistically low. The proven MOA accuracy of this round makes it an easy choice for small game hunting and for target practice, range work or scope setting. It is truly a versatile round for those who prefer to shoot the smaller, lighter-weight loads out of their .223. Fiocchi controls every aspect of the component selection or production process; when they choose to use a high quality projectile from Hornady like this V-MAX load, they can pair it with high quality powder of their own manufacture or by another top tier company. Int his case, powder charge can vary from production lot to production lot, but Fiocchi’s own offering is very clean burning. 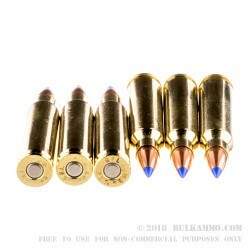 The brass is also of exceptional quality with multiple reloads possible.